If you also spent a majority of your adolescent years embellishing your notebooks with Lisa Frank stickers while a felt poster depicting gorgeous psychedelic giraffes hung on your wall, then you will be equally delighted to find out there is a unicorn-themed cafe in Bangkok where you can live out all your wildest teen-girl fantasies. Located in the Bang Rak district of Bangkok, Thailand and appropriately named The Unicorn Cafe, the glittery desert palace has all the star-shaped beverages and rainbow cakes your Lisa Frank Fan Club heart could desire. The cafe is even stocked with decorative My Little Ponies! The creative and mouth-watering food options include a giant cotton candy milkshake, rainbow waffles, rainbow crepe cake, and even a Unicorn burger with a french-fry horn! It almost looks too cute to eat. 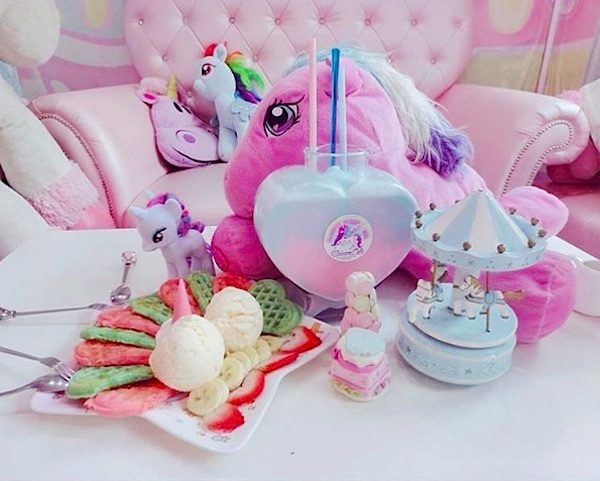 All the plush My Little Ponies spread around the cafe to amp up the whimsy of the sugary wonderland. Even looking at the photos transports me into a frenzy of tie-dyed Lisa Frank sticker collection nostalgia. This truly looks like a saccharine heaven on earth. Are you ready to buy your plane ticket yet?